Discover the ideals for your holiday in Abruzzo! The Cave of Stiffe, a little neighbourhood of San Demetrio ne’ Vestini (AQ), are one of the most suggestive carsic phenomena in Middle Italy. An underground stream, that dug the rock for thousand of years, accompanies the visitors on their route, murmuring and whispering, giving him a scenery of unbelievable beauty, in which the roaring falls are melted to the perennial immobility of the stallattitis and stalagmites. Open, all year through, from 10.00 A.M. ’till 01.00 P.M and from 3.00 P.M. to 6.00 P.M, with the chance to have a guide. You can reach the Caves of Stiffe from Pescara with the highway A 25 (Bussi), and going to Navelli, Fork San Pio delle Camere, Prata d’Ansdonia, and at last San Demetrio De’ Vestini. 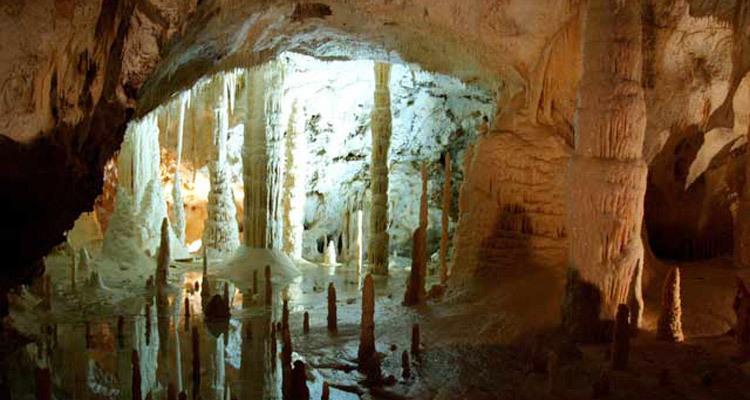 The Caves of Frasassi, with theirs 30 km of extension that lie on 8 different geologic levels, theirs suggestive and silent landscape of stalactites and stalagmites ( the “Giants”, the “Camel”, the “Dromedary”, the “Bear”, the “Little Lady”, “Damocle’s Sword”, the “Slce of Bacon”, the “Slice of Lard”, the “Obelisk”, the “Reeds of Organ”, that play if stroke, the “Niagara Falls”, the “Caste of the Witches”), lances of alabaster, litle dark lakes of crystalline water, represent one of the most suggestive underground routes of Europe. The cave lies into the Commune of Genga, Province Ancona, is the heart of the natural park of the Red Troath and Frasassi. The discoverage of the Caves, the Cave of the River and the Cave of the Big Wind, beging the 28 June 1948 from the Speolocic Group of Ancona. Further to the Abyss Ancona, there are other famous places: the”Room 200″, a corridor of 200 meters, the “Room of the little Candles”, a tear filled with an endless serie of small cylindrical stalagmites, the “White Room” where innumerable laers of pure calcite cover the walls giving a refined alabaster tone, the “Bear’s Room”, that hosts in its middle a stone which seems the statue of a bear, of cause of the tousand year’s erosion of water, the “infinity Room”, whose name comes from the first explorers, who lost orientation in its labyrint. The carsuc cave is visited from 10 million visitors a year, that can choose between a turistic route and with reservation, a speleological route with the whole forniture. The Natural Park and the red Troath of Frasassi, is not only the biggest protected area of Marche, with a treasure of geological atractivness, a rich flora with many forests, and a rising fauna, but also the regn of important monuments and villages ( the medieval suburb of Genga, the neoclassical Temple of Valadier, the Hermitage of St. Mary infra Saxa, that rises out living stones, the romanic and suggestive Abbey of St. Vittore alle Chiuse and the augustean Bridge of St. Vittore. The park is the ideal Habitat for Trekking-, mountain byke- and free climbing lovers and hosts the Thermes of St. Vittore. info@hclara.it or use the form by clicking here! Sign in to our newsletter to always be updated about our last special offers and promotions. I give the consent to the use of my personal data. The Hotel Clara, in Tortoreto Lido, a lovely village on the Adriatic Coast, is the most suitable destination for all who want to spend a relaxing and funny holiday.